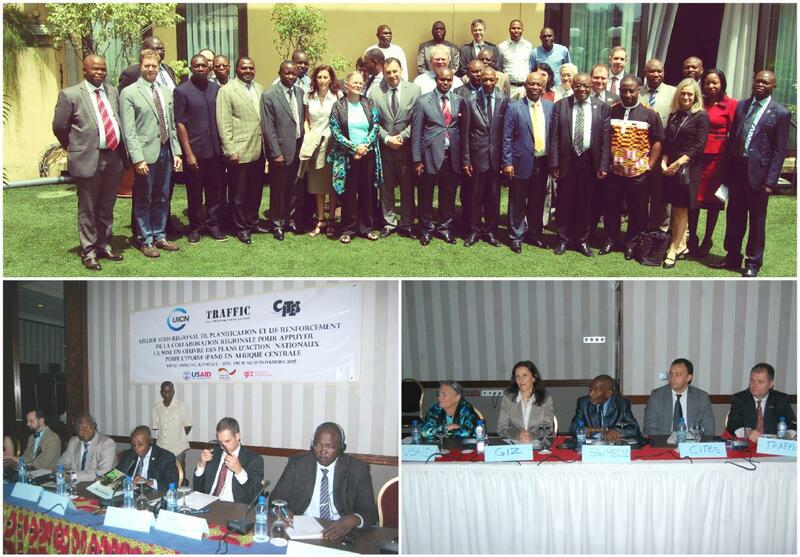 Kinshasa, Democratic Republic of Congo, 24th November 2015 - A two-day regional workshop on National Ivory Action Plans (NIAPs) held in Kinshasa, the Democratic Republic of the Congo (DRC), concluded with participating countries sharing lessons learned and agreeing essential next steps on how to safeguard the future of elephants in Central Africa. The workshop’s objective was to improve the management and conservation of African elephants and reduce poaching and illegal ivory trade through the effective implementation of NIAPs requested by the Convention on International Trade in Endangered Species of Wild Fauna and Flora (CITES) at the country level, and through strengthened transboundary and regional collaboration. Government representatives from Cameroon, Congo, the Democratic Republic of Congo and Gabon, among the countries directed to develop NIAPs, presented their progress with implementation, identifying priority gaps and needs as well as pinpointing essential regional support mechanisms to enhance the effectiveness of their activities. Neighbouring countries shared their key challenges and remedial actions when combatting illegal ivory trade. Deliberations were shared with representatives of the CITES Secretariat as well as with intergovernmental organisations, aid cooperation agencies and partners, independent experts and non-government organisations. The workshop was convened by TRAFFIC with the support of the CITES Secretariat, and made possible through the Wildlife TRAPS (Trafficking Response, Assessment and Priority Setting) Project implemented by TRAFFIC and IUCN, and funded by the United States Agency for International Development (USAID) . Co-support for the workshop was provided by the German Government1. Mr. Scanlon also expressed his thanks to USAID and the German Government for funding the meeting, TRAFFIC and IUCN for initiating it, as well as the host country DRC. Diana Putman, Mission Director USAID in Kinshasa says “The United States is actively working with the countries concerned to better detect illegal wildlife products at ports and airports, stop illegal sales on the Internet, investigate wildlife crimes, bring criminals to justice and run campaigns to better inform the public. These efforts are bearing fruit.”. Roland Melisch, Senior Director Africa and Europe at TRAFFIC, “It was great to see the frank and vibrant discussions and collaborative enthusiasm by government participants and observers at this workshop which has led to the identification of priorities in the fight against illegal ivory trade”. Country-level presentations on the implementation of CITES NIAPs during the workshop concluded that whilst activities were already underway to strengthen controls of domestic and cross-border trade in ivory, and monitoring of ivory markets, several activities have yet to commence or to be formally developed to effectively combat the illegal trade in ivory. Delegates noted that one of the key challenges they encountered is the mobilising of funds to implement their NIAPS. Efforts are being made to include the NIAP activities into national budgets, but external funding and technical support will be crucial to step up the pace of implementation. It was also pointed out that the NIAP process had led to improved coordination between various government services which can play a key role in bringing the illegal trade under control, in particular judicial services, customs and law enforcement agencies, and that this coordination needs to be strengthened further. It was also recognized that more regional cooperation was necessary to track down international poaching networks and improve the protection of elephant populations. While most countries did include activities in their NIAP to improve regional cooperation, most of these have yet to be implemented. In particular, it is necessary to develop regional intelligence-gathering networks. It was suggested that collaborative law enforcement mechanisms already developed under regional organisations such as the Central African Forest Commission (COMIFAC) and Economic Community of Central African States (ECCAS) could play a key role in facilitating regional cooperation in combating wildlife crime and illegal ivory trade. As an output, a menu of priority actions was developed to enhance effective implementation of national, cross-border and regional activities included in NIAPs. The efforts of countries not required to implement NIAPs were also highlighted, with Chad and the Central African Republic stating that their countries would see the benefits of implementing a NIAP, although they are not formally required to do currently. Although not able to participate in the workshop, Nigeria had hoped to attend to discuss its draft NIAP which is expected to be shortly submitted to the CITES Secretariat. This menu of identified priorities will be used by countries and implementing agencies to target potential resources available for delivery of NIAP activities and ensure that the most urgent activities are supported. The CITES Standing Committee will review the implementation progress made by all NIAP Parties, including the four NIAP Parties that participated in the workshop, at its 66th meeting to be held in Geneva from 11-15 January 2016. Finally, the workshop paid tribute to all the rangers who have lost their lives protecting elephants and the natural heritage of the planet from the assault of criminal mafias and armed groups to national parks. In DRC over the last few weeks, several rangers were killed on duty in the Garamba and Virunga National Parks and the Okapi Reserve. Some countries have announced the creation of specialised units to support their work on the field. A workshop report will follow. 1 German government support was received from the BENGO facility of the German Federal Ministry for Economic Cooperation and Development (BMZ), and from the Polifund project, implemented by GIZ on behalf of BMZ and the German Federal Ministry for Environment, Nature Conservation, Building and Nuclear Safety (BMUB). Polifond combines the expertise and resources of five German ministries, international organisations and NGOs to combat poaching and the illegal trade in wildlife products (ivory and rhino-horn) in Africa and Asia.